Creativity and a love for art have been passed along in Grace’s family for generations. 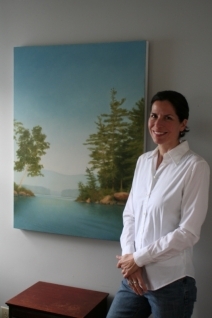 Her desire to be an artist took hold early on, and the journey began while she was a student at the prestigious Silvermine Guild Arts Center in New Canaan, Connecticut. Grace then continued her studies at the School of Visual Arts in New York City, earning a Bachelor of Fine Arts degree in 1985. Before dedicating herself to painting full time, she was a textile designer for fine printed fabric in both the apparel and home furnishing industries. Grace’s work has been shown in juried and invitational exhibitions and her paintings are in private collections throughout the United States. Living in New London, New Hampshire, Grace is represented by the New London Gallery, and the Cove Gallery in South Chatham and Wellfleet, Massachusetts. "Inspired by what lies beneath the obvious, my paintings touch on the subliminal. It’s not the details that are highlighted, but the underlying moods and emotions. Painting in my studio, I use sketches and photos primarily as a starting point, relying more on intuition and memory for the process. By layering thin washes of color onto the canvas, the work is given a soft diffused and ethereal quality. I’m drawn toward the abstract and minimal aspects of the landscape, which for me evoke a sense of peace and serenity, something I feel we all yearn for at times."